Dogs affected with Chondrodysplasa live long and happy lives, and are no less a perfect pet than any other Malamute. 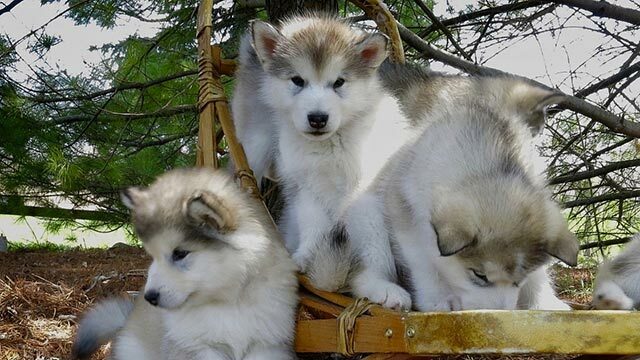 Indeed, many who have owned affected dwarf Malamutes say that they have been their favorite pets! And if you are a breeder, please know that this is NOT something you should feel ashamed of, or try to hide. The more open we as breeders are about the prevalence of this disease, the more we can learn from one another. Additionally, right now our research project is in DESPERATE need of samples of confirmed affected dogs and their carrier parents or other close relatives. ANY help you can give in providing these samples will be greatly appreciated, and help speed along our search for a genetic test for Chd. ANY help you can give in providing these samples will be greatly appreciated, and help speed along our search for a genetic test for Chd. 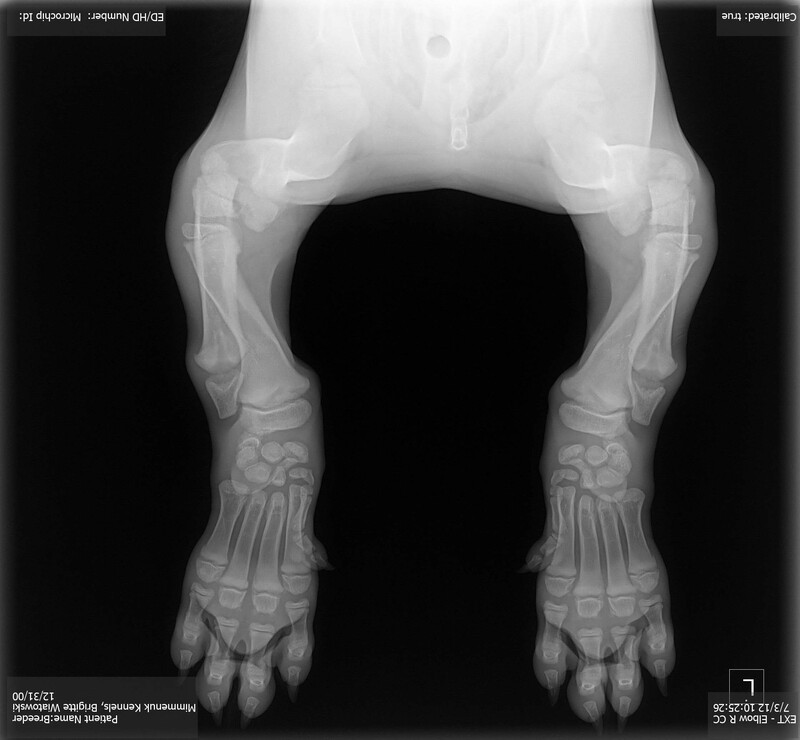 If you are concerned that you might have a puppy affected with Chondrodysplasia, the Health Commitee of the AMCA is very willing to help and assist you in any way possible. We will assist with instructions on xraying of puppies and collection of blood or DNA for shipment to our researchers in Helsinki as well as for banking with the Canine Health Information Center (in the event stored DNA becomes necessary to access). If financial assistance is needed to accomplish this, we will provide what is needed. All queries will be kept confidential if this is requested. Please contact Sandi Shrager at sandis@u.washington.edu. If any other littermates to the puppy you are concerned about are still living with you, it would also be best to have them xrayed and evaluated as well, as many dogs are not as clearly affected as others, and all information about a litter is important to ascertain. Multiple puppies can be xrayed on one film. Most veterinarians have board certified radiologists that they use to read xrays. 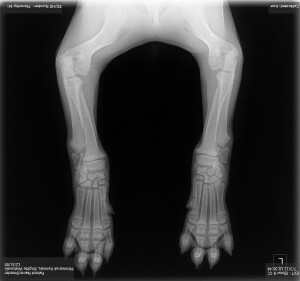 If your veterinarian does not have a board-certified radiologist available, a list may be found at www.acvr.org If the puppy or puppies are confirmed to have Chondrodysplasia, any littermates should also be xrayed by 12 weeks of age. Blood (5 ml EDTA + 3 ml EDTA) should be collected on all puppies, their parents if available, and any grandparents. 1) 5-10 ml to the Canine Health Information Center DNA storage bank. Contact your veterinarian to make arrangements to have blood drawn. This can be done at an appointment made specifically for this purpose, or you can arrange to have the blood drawn during some other regularly scheduled visit. Be sure to tell your veterinarian the blood sample is to be used for research purposes. Many veterinarians will then do the procedure at a reduced rate or at no cost. Take your dog and ask that a sample of 5 to 10 cc’s of whole blood be drawn into EDTA purple top tubes. If collecting multiple samples, please take care to ensure matching the correct samples with the correct names. 3. The blood sample only needs to be put in the tubes and rocked gently a few times to distribute the anticoagulant. The sample should NOT be spun, have serum extracted, or have anything further done to it. 4. Ship the sample via an overnight delivery service to the University of Missouri (address below). DO NOT ship samples on Fridays, as there will be no one available at the lab to receive the sample on Saturday. 5. The sample should be shipped using cool packs, and ideally should be shipped immediately. If samples are held for a day or over a weekend before shipping, they must be refrigerated. 6. Complete the application form/health survey for each dog and send it to the OFA using the OFA mailing label provided. The health survey is a critical part of the repository. The samples are of little value without the corresponding phenotypic history and genealogy. It is critical to note on the application form that the sample corresponds to a Chd affected dog, or a carrier. If there are any significant health changes for this dog in the future, please email the OFA at ofa@offa.org with the update. 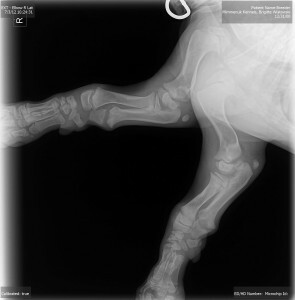 ALL BLOOD SAMPLES FOR CHD AFFECTED DOGS OR THEIR CARRIER RELATIVES MUST BE ACCOMPANIED BY A RADIOLOGIST’S FORMAL REPORT. 1) 3ml EDTA to research group in Helsinki. In the sample shipments you need to include a proforma (for the US authorities) and an import permission (for the Finnish customs). You will find these attached. You need to put these two on a plastic pouch to the outside of an envelope or a box in which you are sending the samples. On the proforma you will need to add your name and signature and contact info. Nothing needs to be added to the import permission. (it’s a few things to remember but these forms are needed for shipping from the US to Finland). If it is possible, we would recommend you send the samples for example using Fedex. In the Fedex form you need to put the value of the shipment to $1 and specify that you are sending released animal specimens (UN3373). You could use also international priority but there’s less guarantee that the shipment will arrive in reasonable time. The blood should be shipped chilled. Sample to Helsinki Import Permissions English Blood Sample Form ALL BLOOD SAMPLES FOR CHD AFFECTED DOGS OR THEIR CARRIER RELATIVES MUST BE ACCOMPANIED BY A RADIOLOGIST’S FORMAL REPORT. PEDIGREE IS ALSO REQUESTED AS WELL AS DETAILS ON HOW SAMPLES ARE RELATED TO ONE ANOTHER (IF MORE THAN ONE SAMPLE SUBMITTED).